The Seahawks produced three eye-popping offensive plays Sunday against Philadelphia, the most unusual of which involved Russell Wilson and Doug Baldwin in a reversal of roles. Three offensive plays by the Seahawks stood above the rest in their 26-15 win over the Philadelphia Eagles Sunday at CenturyLink Field. First, rookie RB C.J. Prosise bolted 72 yards for a first-quarter touchdown. Then, QB Russell Wilson manufactured a something-out-of nothing 35-yard TD to Jimmy Graham to stake the Seahawks to a 13-7 lead. 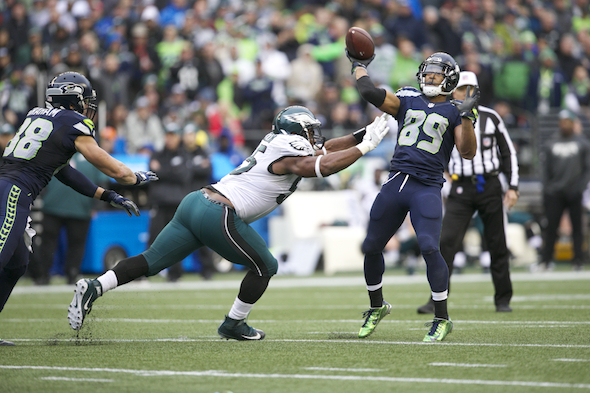 Finally, Wilson caught a 15-yard TD from Doug Baldwin that put the game out of reach, 23-7. Prosise’s TD was the longest run from scrimmage in CenturyLink history (since 2002) and the third-longest by a Seahawk in the Pete Carroll era. To that should be added that only one other rookie in franchise history had a longer scoring run, and that was by a wide receiver, Joey Galloway, who tallied from 86 yards on an end-around at Jacksonville in 1995. The Wilson-to-Graham TD came on a third-and-11, and the manner in which it developed suggested the Seahawks were primarily interested in keeping Stephen Hauschka in position to kick a field goal. Instead, after dropping back, Wilson pirouetted his way out of trouble, ran to his left and, with no leg power, threw a seemingly impossible liner across the grain. Graham snatched it and escaped the clutches of Jaylen Watkins to get the TD. Only one quarterback in the NFL could have made that throw. “When Russell came out of the pocket, he was thinking about having to throw the ball away,” said coach Pete Carroll. “You could see he was at a moment where he could have gotten rid of the football and it would have been the right thing to do. But he waited it out and hit Jimmy perfectly. The Baldwin-to-Wilson TD was, based on history, sheer novelty. On an end-around, Baldwin took the handoff, ran right, stopped and threw back to an open Wilson on the left. Wilson dove into the end zone, marking the first TD catch by a quarterback in franchise history. It also marked one of the most unusual types of touchdowns in post-merger (since 1970) history. Since the NFL banded with the AFL 46 years ago, only 15 quarterbacks have caught touchdown passes. Throw out Kordell Stewart (1995-05) and Brad Smith (2006-14), both of whom saw extensive playing time at wide receiver during their careers, and 13 full-time quarterbacks snagged TD passes. Of those, two caught two. Chicago’s Jim McMahon caught both of his from RB Walter Payton, 1983 vs. the Rams (18 yards) and 1985 vs. the Redskins (13 yards). Dallas’ Danny White caught one from RB Ron Springs in 1983 vs. the Raiders (15 yards), and another from RB James Jones in 1985 vs. the Browns (12 yards). “I think we’ve been trying to call that the past four or five years,” said Wilson, who disclosed that Seattle had the ruse in its playbook for several weeks before breaking it out against the Eagles. Wilson’s catch Sunday was not his first. Technically, it was his third. The second wasn’t a designed play: it was a tipped pass against Arizona Oct. 23 that Wilson snatched out of the air for a one-yard loss. Wilson caught his first, in the first quarter, against the Denver Broncos Sept. 21, 2014. The play largely got lost in the rehash of the rematch between the participants of Super Bowl XLIX the previous February. Wilson’s reception, on a ball thrown by WR Jermaine Kearse, went for 17 yards and set up a 20-yard field goal by Hauschka in what became a 26-20 Seattle overtime win. The Seahawks have led the NFL in scoring defense in each of the past four seasons and have an opportunity to make it five consecutive after holding the Eagles to 15 points. Seattle is allowing 17.3 per game, No. 1 among the NFL’s 32 teams. If the Seahawks remain No. 1, they will tie the 1953-57 Cleveland Browns, who played 12-game schedules, for most years in a row leading in fewest points allowed. Wagner has 78 tackles in his past six games. In 1990 (the year Wagner was born), Nesby Glasgow led the Seahawks with 83 – in 16 games. Wagner is the first player in franchise history to record 100-plus tackles in five consecutive seasons. He has 586 for his career since coming to Seattle as a second-round pick in 2012. The Associated Press has twice awarded its Defensive Player of the Year award to a Seattle player, S Kenny Easley in 1984 and DE Cortez Kennedy in 1992. Three years ago (2013), Carolina’s Luke Kuechly interrupted a string of Defensive Player of the Year awards by Houston’s J.J. Watt after making 156 tackles and recording two sacks from the same position Wagner plays. If Wagner maintains his pace at 10.8 tackles per game, he’ll finish with 173 (Seattle’s record is 153 by Terry Beeson in 1978) and four sacks. If Kuechly can win with 156 and two, Wagner is certainly a strong Defensive Player of the Year candidate.